Keep in mind that the term “loophole” can have two different meanings — one being a small space from which to shoot from or into, and second, the expected bullet trajectory arc. For the purpose of this section, we refer to loopholes as the former, a small space to shoot either from or into. The idea of ballistic trajectory arc and how it’s related is explained separately to avoid any confusion between the two. When employed correctly, a loophole can be a powerful tool in a sniper’s arsenal, concealing their position by visual and audible measures. A loophole is a small figurative window for a projectile to pass through. Depending on the perspective of how you utilize a loophole, the loophole could be a doorframe or window that you are either shooting out of or into. Alternatively, it could be the visual width between something like two trees or walls. Loopholes function by breaking up your outline and masking your shooting position. Some loopholes can be created naturally with the use of objects, which minimize your visual and thermal signatures and subsequently provides both cover and concealment in the case of return fire. Objects that can form loopholes may include a rock and a bush, two buildings, or a single large crack or hole in a wall. These are all examples of spaces between objects and can be leveraged as a loophole. Loopholes can be “opened” or “closed” with your motion, thereby physically altering the viewing perspective you (and the enemy) can see each other through the objects. Such is the art of angles. Using a loophole can be to a shooter’s advantage, but it also carries risks. Any proper Firing Position (FP) includes a loophole that will allow you to neutralize your intended target and subsequent ones, if necessary. Trying to use too small of a loophole could cause your bullet to hit the objects along the way. This could completely compromise your position and ruin your element of surprise. Let’s explore two different styles of loopholes you might employ as part of your craft in the field. Engaging from a loophole is the act of shooting though a loophole when you are positioned directly behind it. This style pretty much lends to the definition of a “hide” with most snipers performing it instinctively upon entering an FP. The funny thing about loopholes is that a sniper may not even realize they’re using a technique at all — it’s such a natural exercise to perform during combat. This type of loophole leaves the target nowhere to hide, unable to see you until he discerns your cover/concealment. The advantage is clear in helping to mask your figure while you engage a target or glass an area for intel for a sustained period of time. Provided cover and concealment is good, you are rewarded with a large sector of fire and an enemy who has to work hard to locate you while not exposing there character. Unlike the next loophole type, the upside to this traditional approach on a loophole means that you are not nearly affected by tunnel-vision over distance, though some still exists. Engaging into a loophole is the idea of sending rounds through a similar figurative window, but this type differs in that the objects working to create the loophole are more centered between you and the target. The idea is that you are not just positioned close behind the objects that are screening you; rather, you are shooting through a “tunnel” of objects. Loopholes like these can be as large as you wish, yet can only be as small as the projectile’s full path. Clearance for the round itself to pass through, as well as room for the trajectory of the round or arc, must be factored in to successfully use this loophole. In fact the biggest challenge you will encounter, primarily at longer ranges, is having enough vertical clearance for the ballistic trajectory arc. This arc is the path the round travels from the time it leaves the muzzle to the point of impact. The height of this arc will vary depending on the type of round you are firing, which directly correlates to the velocity it’s traveling at through the air. Keep in mind that shooting at longer ranges is essentially “lobbing” bullets in an arc due to the velocity decreasing more and more over distance. Simply put, the longer the range the less flat the arc will be. An example of engaging into a loophole is featured above. Knowing the trajectory arc is important. 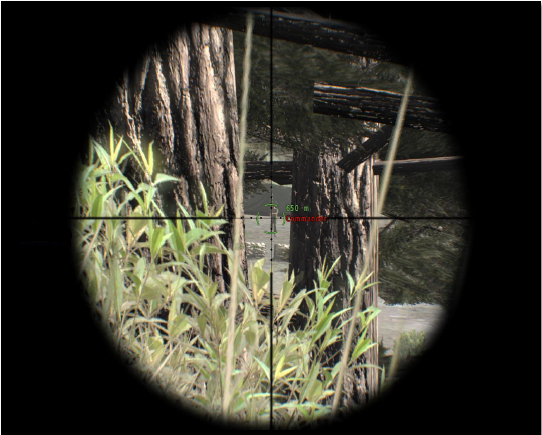 In this example, if the sniper moved a few feet forward from their current position, the bullet would actually hit the tree branch sticking out from the second tree and the shot blocked. Acquisition and tracking of the target is good for the moment but awful over time; a drawback to this type as opposed to engaging from a loophole. This is why shooting into a loophole is most only effective against static targets and when you’re not planning on engaging any surrounding targets. The tunnel-vision for this loophole can be crippling to your effectiveness in capturing intel as well! Now if the target moves as little as 5 feet, the loophole is no longer a viable option again because of obstructions along the trajectory arc. The feasibility of employing any type of loophole changes drastically based on the distance the loophole objects are away from you and the target, all in relation to the trajectory arc of your round. The loophole is an complex geometrical balancing act that demands constant awareness and adjustment in order to be rewarded with a window through which to conduct your lethal business.